Other: cardstock, ink, watercolor paper. Other: Ranger Archival Ink/Watering Can, white card base, Scrapbook Adhesive 3D foam dots, Tombow Taper Runner, Royal Langnickel Watercolor Paints, watercolor paper, paintbrush. *Designer Note: Nicole re-shaped the word joy into you on the front of the card. 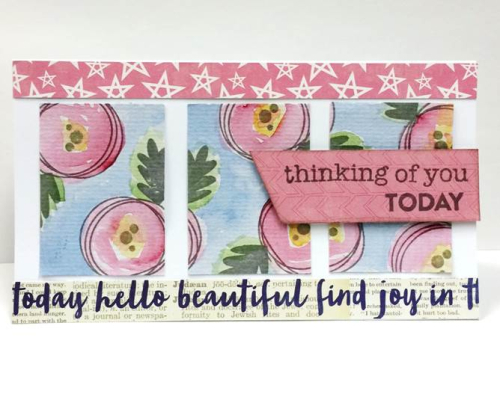 Other: Bazzill cardstock, Luxe Memento ink, Spellbinders scallop border die. 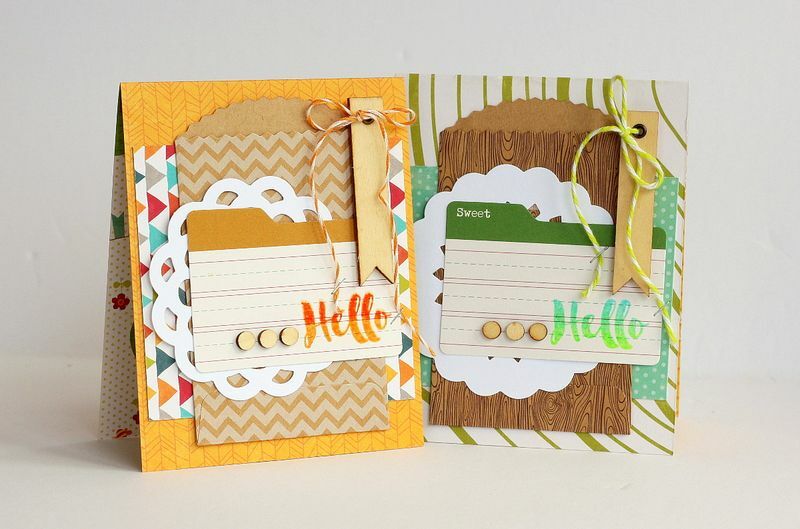 *Designer Challenge Note: Jillibean Soup wood veneer shapes, words and dots can easily be colored with your favorite inks. Other: white cardstock, pink felt, hemp twine. 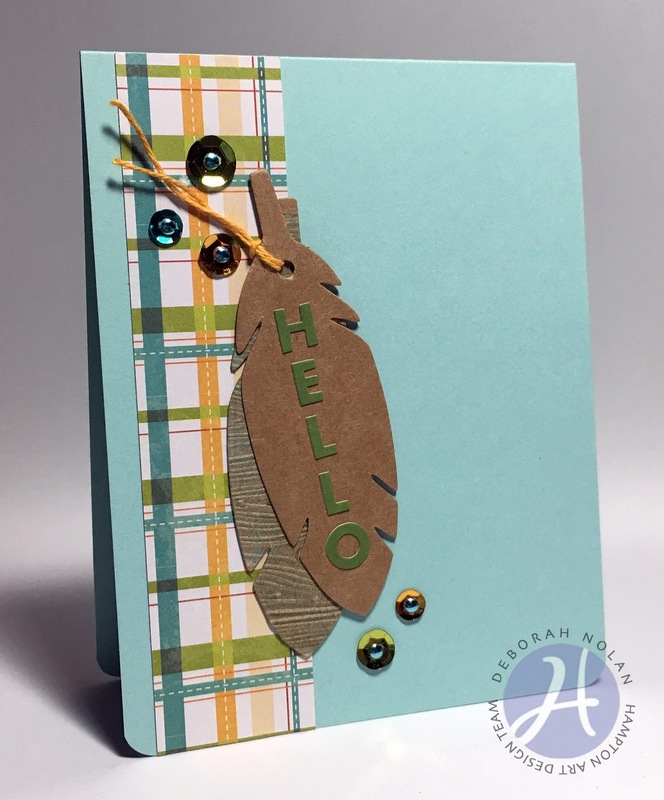 *Designer Note: Metal dies are great for die cutting things like fabric and felt that can’t be easily cut with an electronic cutting machine. 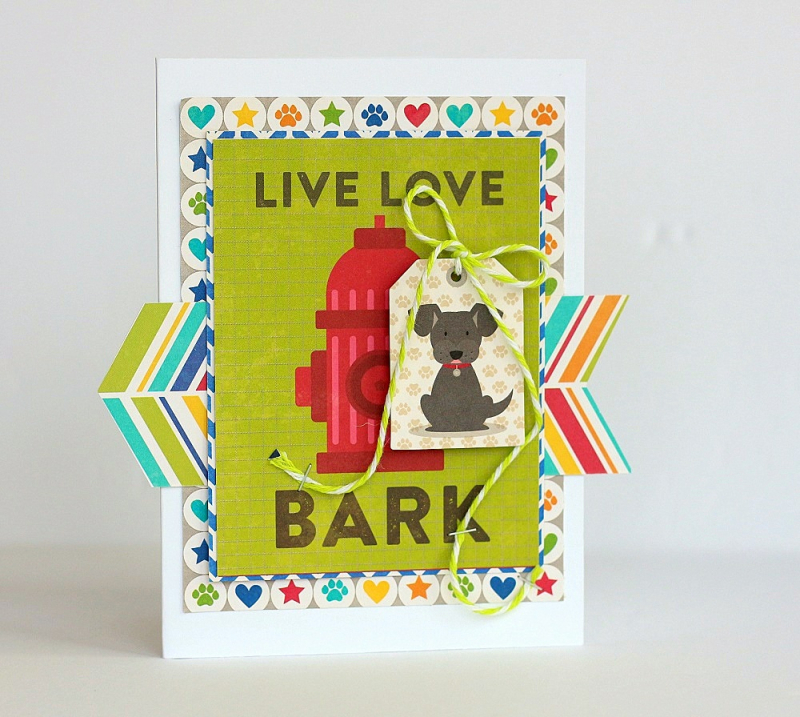 For smooth clean die cut shapes, back fabric with coordinating colored cardstock. This added weight makes the shapes super easy to work with. We are so EXCITED to share with you some brand new additions to our very popular Mix the Media wood collection! Which one is your favorite? What would you create? Where would you display your project? Personally, my new favorite is the 18"x24" white wash planks. I love how Jill always cuts fun stencil designs on her Silhouette and uses either spray paint or craft paint to create perfectly customized wall decor. Guess what? Leave a comment over on the Jillibean Soup blog post HERE and we will select 4 (FOUR!!!) winners to receive one of the new Mix the Media wood pieces of their choice. Doesn't get much better than that! Recently when we needed a cute project for Bible Class I grabbed this new wood stamp. “Bless Your Heart” it was a perfect sentiment for the kids to make favor bags for their Mom’s for Mother’s Day. But guess what? they work for a quick teacher gift too. The three new tags from Hampton Art really made a statement together with the new stamp. I started with Jillibean Soup Party Playground favor bags, several colors and designs are available. We added some candy into each bag and then began to layer on the goodness. First we stamped on the new plain tags in dark brown ink the “Bless Your Heart sentiment. Then set it aside to dry. Next we folded over the bags and added a doily (got these ones at the dollar store). Then the kids chose a color border oval tag and wrote their message to their Mother’s. 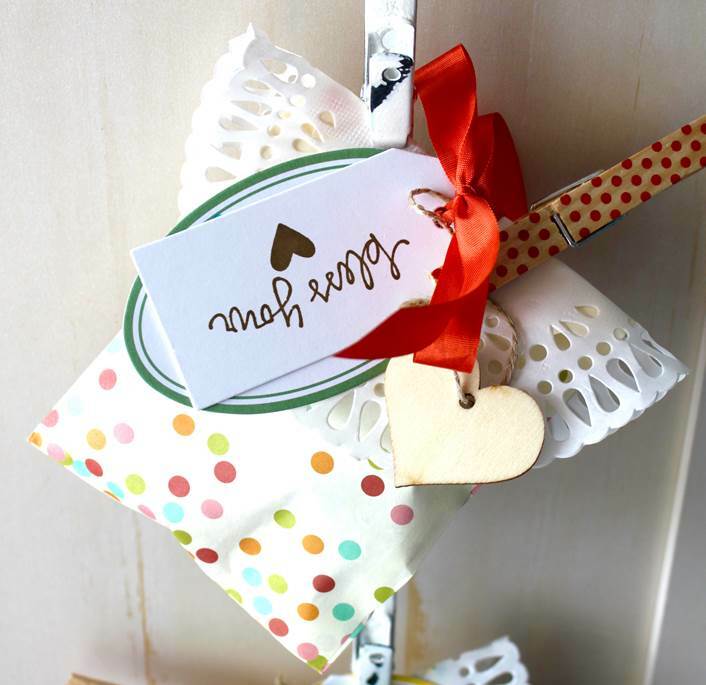 Then we grabbed the fun new heart shape wood tags. Last we layered those all onto the favor bag as shown in the picture with some added ribbon and a Party Playground wood clothespin finished it off. 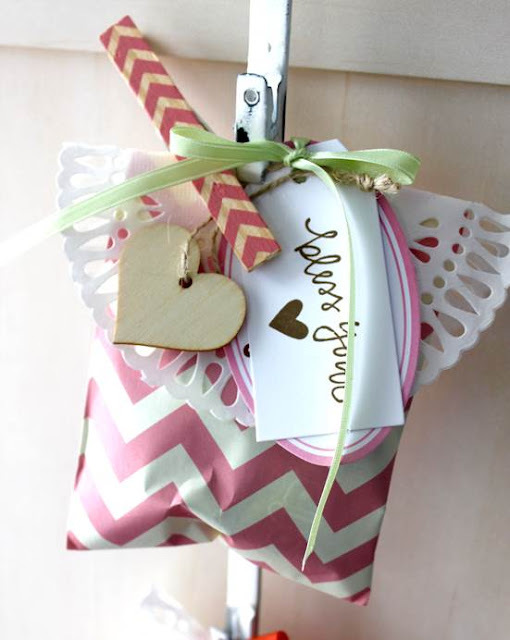 That was all, a cute and simple favor bag for any occasion. 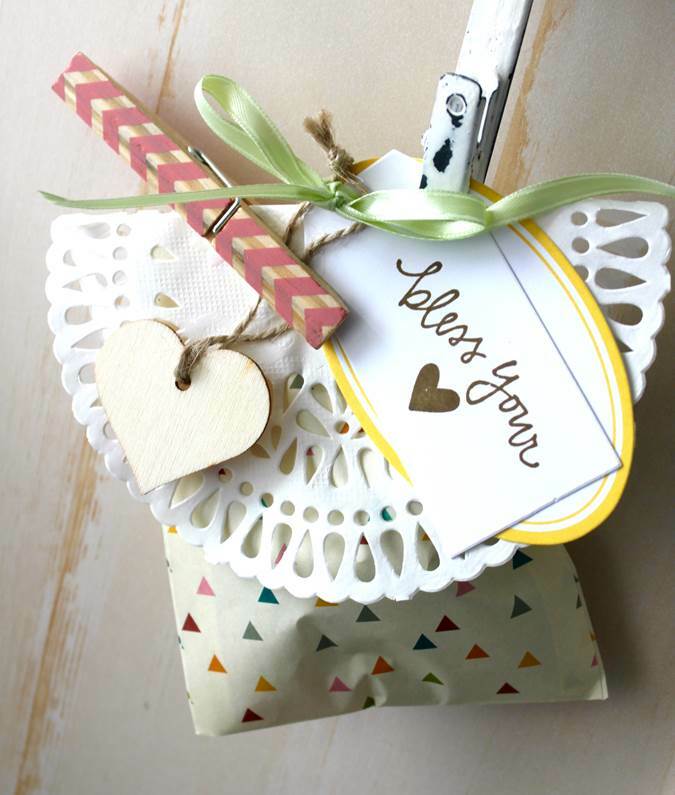 Do you like to make favor bags? If so share with us on Facebook or here on the blog we would love to hear about it! Other: white card base, white thread, sewing machine, Scrapbook Adhesives 3D foam dots, Tombow tape runner, Royal Langnickel Watercolor Paints, watercolor paper, paintbrush. *Designer Note: Break out those Happy Hues and give them a coat! Here is another card that uses the new Coloring book style design trend. This one was made for a special graduate, an encouragement to be her beautiful self. 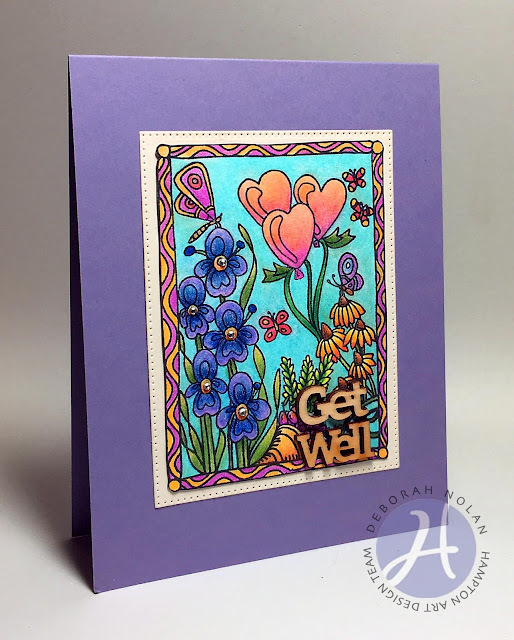 This is a brand new “Color Me” stamp set from Hampton Art, complemented by the new Healthy Hello papers from Jillibean Soup. Once again I stamped the image in dark gray ink onto watercolor paper and then watercolor painted the image. It is a lot of fun and it doesn’t take very long to completely color the image. 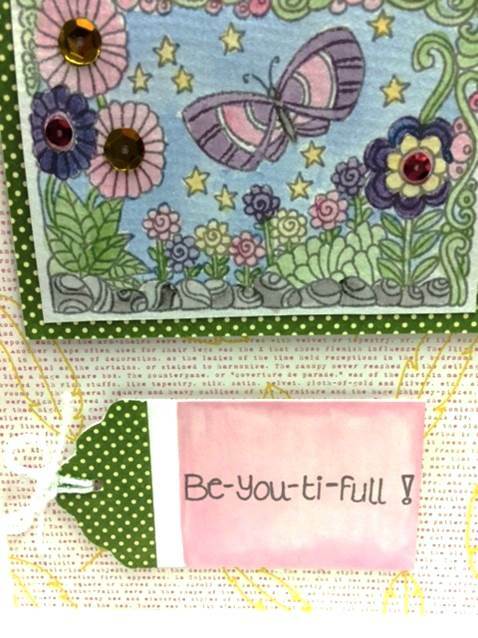 Next I chose one of the brand new watercolor tags and stamped the be-you- tiful sentiment onto it in dark gray ink. The tag needed something more so I used the green salt paper to coordinate it with the mat for the painted image as shown to pull the card together. 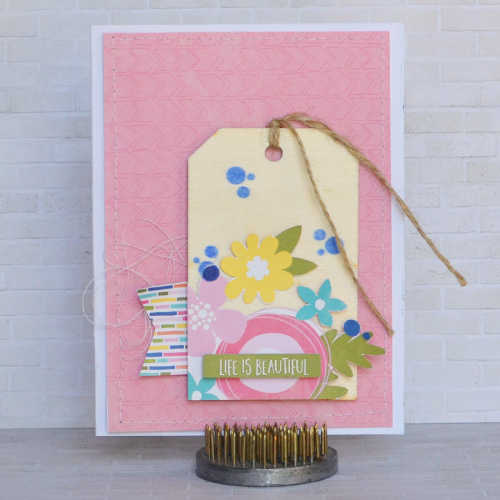 Both the image and the tag were added onto the card with 3D pop up dots. Last I added an iridescent yarn bow onto the tag and some of the new adhesive sequins as flower centers for a bit of bling. Then it was complete, I think it makes a nice encouragement card. The time spent painting or coloring these type of images can be quite relaxing. When I received my box of new products from Hampton Art I was really excited to see lots of stamps in the new Coloring Book trend design style. 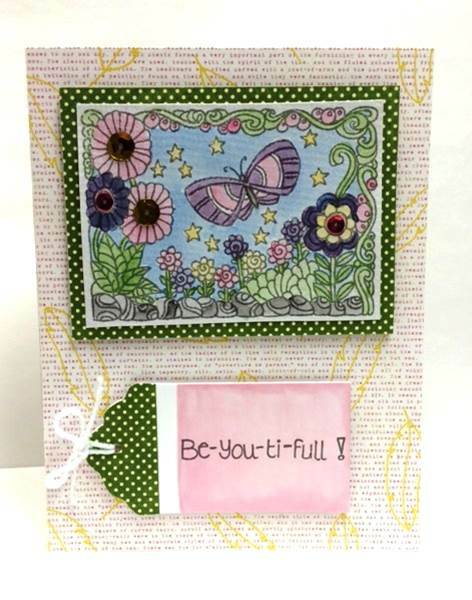 This card was made with one of those new clear stamp sets and I added some Jillibean Soup papers and the really cool wood slice tag is also new from Hampton Art. So I am not a copics user yet so I decided to give this stamp a try using watercolor paints. I stamped the image in gray ink onto watercolor paper and then I watercolor painted the design. I really like how it turned out and this allows you to completely customize the color palette. I decided to stamp the sentiment directly onto the wood slice tag with dark gray ink and it worked great. 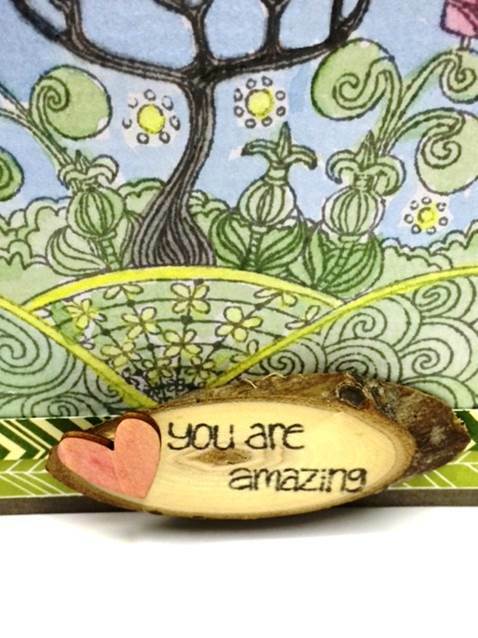 Then I grabbed a wood veneer heart and watercolor painted it and added it to the new wood slice tag as shown. I matted the painted image with the Morels paper from the Mushroom Medley collection and added to the card base as shown. Next I cut a border strip from Green Salt paper and then added the wood slice sentiment layered on top as pictured. Now you have an amazing card to share with someone special. I think the Hampton Art new wood products are truly amazing and I really love the new coloring book trend. Have you tried any of the new coloring book designs? If you have we would love to see it, please share on Facebook or here on the blog! So I just had to laugh when I first laid eyes on this new stamp set of Hampton Art and Art Impressions. It is so funny! What better way to encourage healing than laughter? 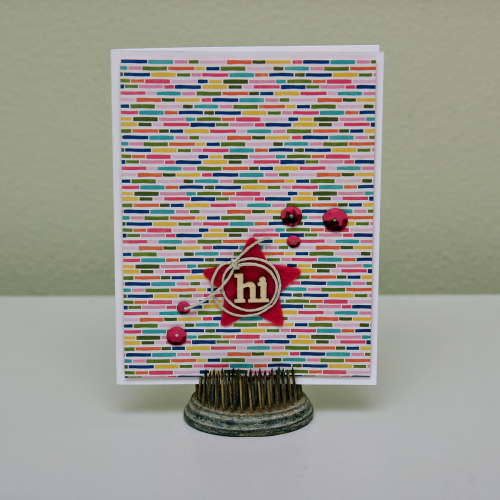 This is a super simple card with just a couple layers of Jillibean Soup papers from the new Mushroom Medley collection. I began with a plain white card base and then layered on the plaid paper. Then I stamped the image onto kraft paper in dark gray ink. 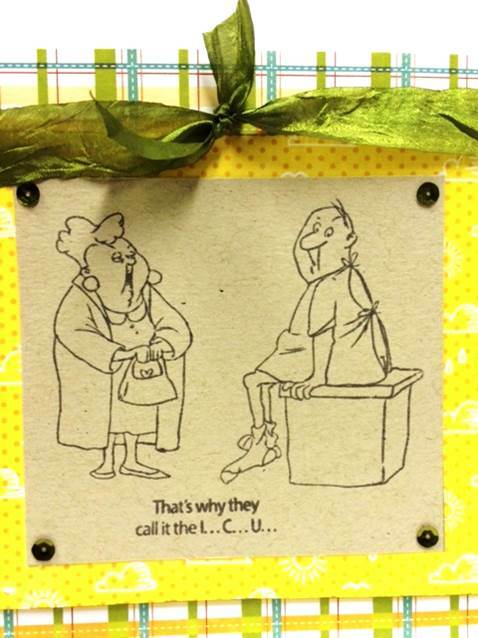 Then stamped the funny sentiment below it as shown, it says: “That’s why they call it the I.C.U….” Ha Ha so cute with the typical gaping back hospital gown. Then I matted the image piece with the cheerful yellow print and added those pieces to the card base using 3D pop up dots. Last I tied on a pretty green crepe ribbon and added some green adhesive sequins. 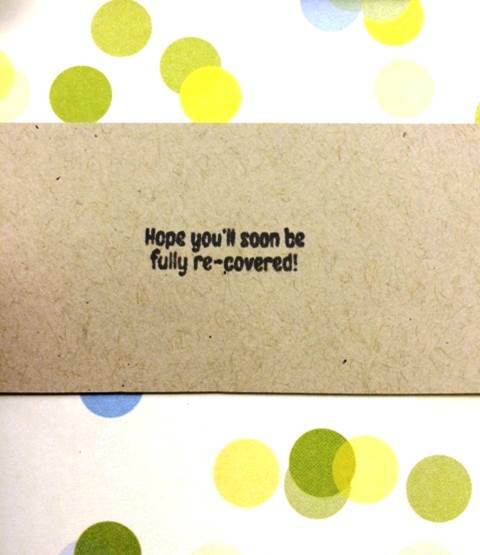 To complete the card I had to add the inside sentiment which says: “Hope you’ll soon be fully re-covered!” Too funny, right? This stamp set is a keeper to be sure. 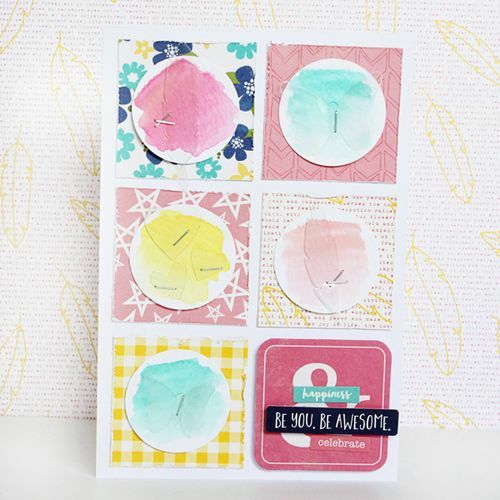 Today's card features some goodies from Jillibean Soup's Mushroom Medley collection! 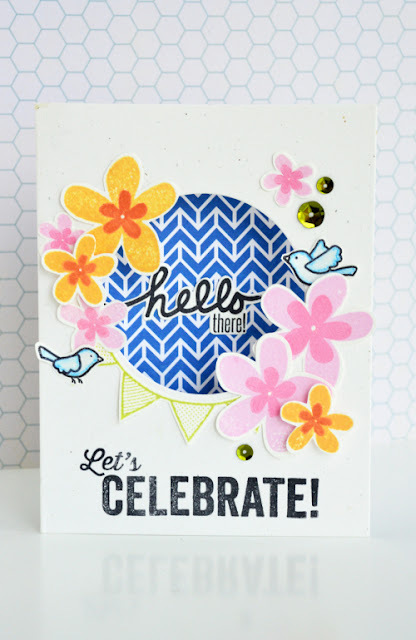 Make a 4.25” x 5.5” base from cardstock. 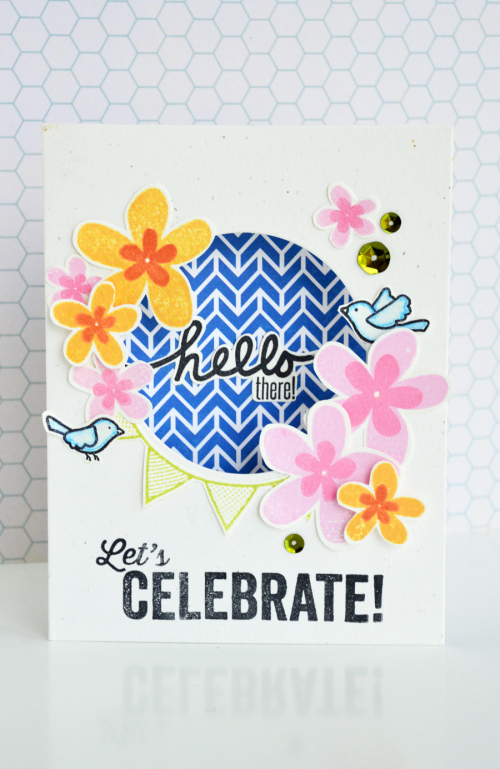 Die cut 12 hexagons from PP and adhere. Wrap panel with cord and tie into bow. Adhere Pea Pod heart with foam dimensional tape. 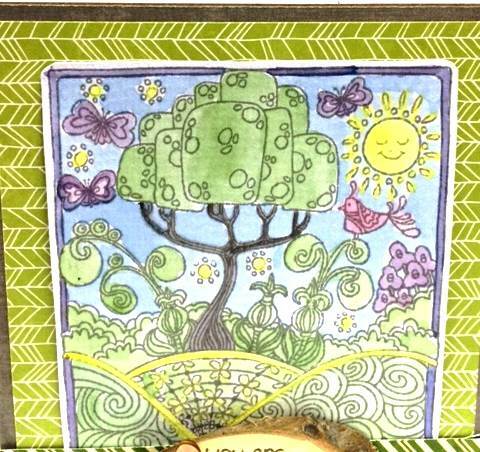 Today's card features papers and Pea Pod Parts from Jillibean Soup's Mushroom Medley Soup collection. 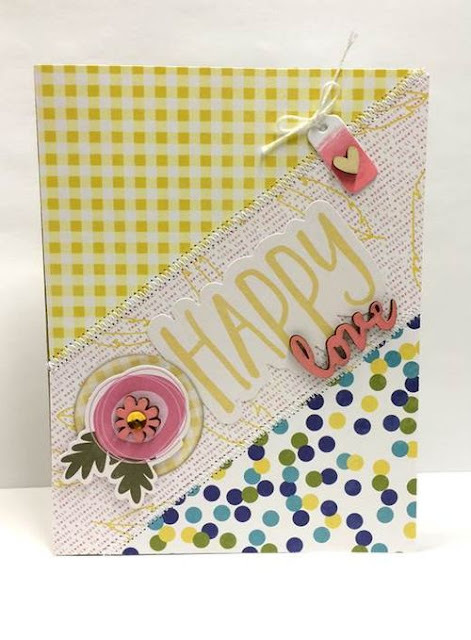 Make 4.25” x 5.5” base from yellow card and round bottom corners. Cut panel from aqua card, round bottom corners, dry emboss, and adhere to card. Adhere flowers and word bubble with foam dimensional tape. 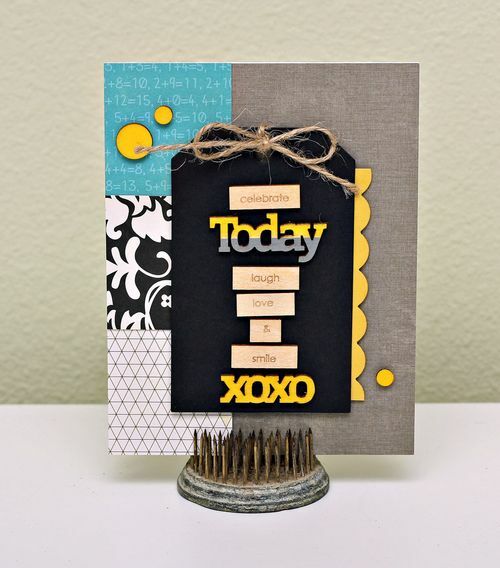 Today's card features all kinds of goodies from Jillibean Soup and a little sump'in'-sum'pin' from Hampton Art! 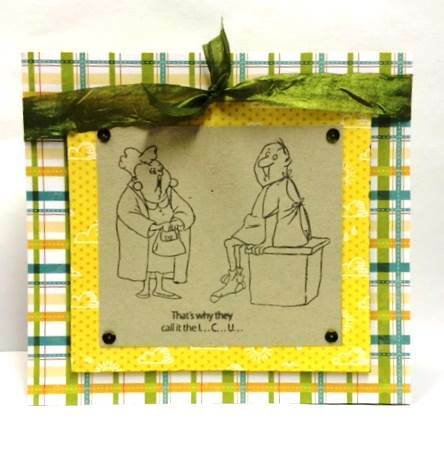 Make card base for a 4.25” x 5.5” card from cardstock and round bottom corners. Cut and adhere 1.25” x 5.5” panel of Mushroom Medley PP. Stamp woodgrain on feather tag and adhere. Apply letter stickers to feather tag, thread hole with hemp, and adhere. Adhere sequins and nailhead stickers. Good morning, People Who Love Paper! 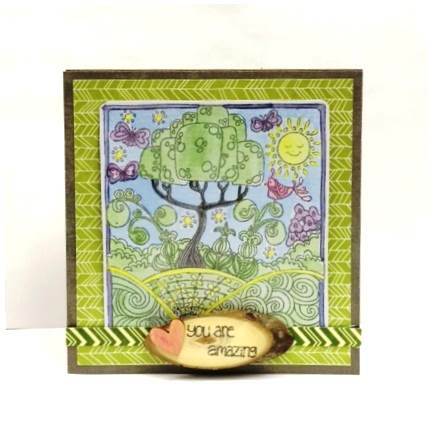 Today's card features a fantastic clear stamp from Hampton Art and some wood veneer words from Jillibean Soup! Stamp image on white cardstock and color. Fussy cut around image's border and run brush marker around outer edge. Die cut panel from white cardstock and adhere to card. Adhere colored image to die cut panel. Adhere wood veneer words and gems. Other: white cardstock, watercolor paints, stapler.